This article was last updated Jun 08, 2018, but some terms and conditions may have changed or are no longer available. For the most accurate and up to date information please consult the terms and conditions found on the issuer website. If you’re a member of the American Airlines AAdvantage® loyalty program, the Citi® / AAdvantage® Executive World Elite™ Mastercard® is a great option for you. You Earn 2 AAdvantage® miles for every $1 spent on eligible American Airlines purchases & 1 AAdvantage® for every $1 spent on other purchases* — but it comes with a $450 annual fee. New cardmembers Earn 50,000 American Airlines AAdvantage® bonus miles after spending $5,000 in purchases within the first 3 months of account opening*. Once you’ve spent the required amount to get the bonus points, it’s enough to get a business-class ticket to the Caribbean. Earn 10,000 Elite Qualifying Miles (EQMs) after spending $40,000 within a calendar year. Get a complimentary Admirals Club airport lounge membership for you and up to two guests or your immediate family. You also get priority check-in, priority airport screening (where available), early boarding and first checked bag free for you and up to eight companions on the same reservation. There’s a 25% discount on in-flight food and beverage purchases on American Airlines flights. The card also comes with a $100 statement credit every five years to cover the application fee for Global Entry or TSA Precheck. 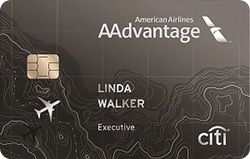 The Citi® / AAdvantage® Executive World Elite™ Mastercard® is a great option if you fly American Airlines regularly. One of the top benefits of this card is how it helps you get Elite Qualifying Miles (EQMs), which help you get and maintain premium status — gold, platinum, executive platinum and platinum pro — on the airline. You earn 10,000 EQMs after you spend $40,000 on the card within a calendar year. Airline lounge access: The Citi® / AAdvantage® Executive World Elite™ Mastercard® comes with a complimentary Admirals Club airport lounge membership — valued between $450 and $550 per year depending on your program status — that covers more than 50 locations worldwide. Up to two guests or your immediate family may accompany you in the lounge. Authorized users: You can also add up to 10 authorized users on the Citi® / AAdvantage® Executive World Elite™ Mastercard® at no additional cost, and the points they earn will count toward your spending to accumulate EQMs. Each authorized user you add also receives Admirals Club access, even when they are not traveling with you. Priority status and checked bags: The Citi® / AAdvantage® Executive World Elite™ Mastercard® offers a slew of perks that can make your travel on American Airlines easier. You get priority check-in, priority airport screening where available and early boarding for you and up to eight companions on the same reservation. You and up to eight customers on the same reservation will also get their first checked bag free. At $50 a bag round trip, the card’s $450 annual fee is covered if you take one trip with eight traveling companions. Credits and discounts: You get a $100 statement credit every five years to cover the application fee for Global Entry or TSA Precheck. And the card gives you a 25% discount on in-flight food and beverage purchases on American Airlines flights. This card has no foreign transaction fee. American Airlines’ Reduced Mileage Awards program allows Citi® / AAdvantage® Executive World Elite™ Mastercard® cardmembers to redeem miles for discounted round trip or one-way travel on MileSAAver awards to destinations selected every other month. The discount is 7,500 miles round trip or 3,750 one way. AAdvantage miles can also be used to upgrade your seat on American Airlines flights. Airline and hotel partners: There is no maximum number of AAdvantage miles you can earn on the Citi® / AAdvantage® Executive World Elite™ Mastercard® and miles don’t expire as long as you earn or redeem miles once every 18 months. You can’t transfer your miles to other loyalty programs, but you can use them on partners in the oneworld alliance (12 other airlines), along with 22 featured hotels and hotel partners. The perks above more than pay for the card’s $450 annual fee. You must be committed to American Airlines, because you can only use your miles on that carrier or oneworld and its partner airlines. Those miles can’t be transferred to other airline or hotel loyalty programs like other luxury credit cards. The 10,000 EQMs only count toward elite status qualification for the AAdvantage program. They don’t count toward AAdvantage Million Miler status, and they can’t be redeemed for award travel, AAdvantage miles or any other AAdvantage program awards. Reduced Mileage Awards can only be booked by phone through American Airlines reservations or at an airport or a local ticket office, and you will be charged $35 for the privilege. There’s no way to earn more bonus miles. The Citi® / AAdvantage® Executive World Elite™ Mastercard®’s Earn 2 AAdvantage® miles for every $1 spent on eligible American Airlines purchases & 1 AAdvantage® for every $1 spent on other purchases* isn’t as good as other cards in the luxury category, like The Platinum Card® from American Express or Chase Sapphire Reserve®. The Citi® / AAdvantage® Executive World Elite™ Mastercard® doesn’t have the travel, rental car and retail perks available with other luxury cards. And some may be put off by its $450 annual fee or the spending needed to Earn 50,000 American Airlines AAdvantage® bonus miles after spending $5,000 in purchases within the first 3 months of account opening*. Dedicated Concierge. Get access to a staff of experts for help with foreign and domestic travel, shopping, dining, household and entertainment needs. Citi® Private Pass®. Buy tickets to concerts, sporting events, dining experiences and family entertainment. Use the Citi® / AAdvantage® Executive World Elite™ Mastercard® for all your eligible American Airlines purchases for double miles. This will help you build up your account and get you the yearly bonus EQMs to maintain your premium status. The Chase Sapphire Reserve® has the same $450 annual fee as the Citi® / AAdvantage® Executive World Elite™ Mastercard®. But you get more flexibility with how you can use your points and more perks with the Chase Sapphire Reserve®. New cardmembers Earn 50,000 bonus points after you spend $4,000 on purchases in the first 3 months from account opening. If you spend the required amount needed to get the bonus (which is $1,000 less than the Citi® / AAdvantage® Executive World Elite™ Mastercard®), you’ll get $750 that you can use for travel on the Chase Ultimate Rewards® website. You also get 3X points on travel immediately after earning your $300 travel credit. 3X points on dining at restaurants & 1 point per $1 spent on all other purchases. $0 foreign transaction fees. This is a better offer than Citi® / AAdvantage® Executive World Elite™ Mastercard®. Cardmembers get $300 annual reimbursement for travel purchases charged to your card including airline tickets/fees, public transportation, tolls, car rentals, lodging and even cruises. You also get a credit of up to $100 to cover the application fee for Global Entry or TSA Precheck. The foreign exchange fee is $0. The Chase Sapphire Reserve® allows you to transfer your points 1:1 toward nine airline and four hotel loyalty programs. It also gives you access to more than 1,100 Priority Pass Select airport lounges worldwide, a membership that usually costs $399 a year. Finally, the card allows you to get 50% more value on your Chase Sapphire Reserve® points when you redeem them for travel at the Chase Ultimate Rewards portal. The Chase Sapphire Reserve®’s $450 annual fee, even with all the perks, has drawbacks. The card’s $450 annual fee isn’t waived in the first year, nor does it have an introductory APR rate. You can’t get into major airline lounges with this card, and you must pay a $75 charge for each authorized user you want to add. Rewards Earn 2 AAdvantage® miles for every $1 spent on eligible American Airlines purchases & 1 AAdvantage® for every $1 spent on other purchases* 3X points on travel immediately after earning your $300 travel credit. 3X points on dining at restaurants & 1 point per $1 spent on all other purchases. $0 foreign transaction fees. Sign-Up Bonus Earn 50,000 American Airlines AAdvantage® bonus miles after spending $5,000 in purchases within the first 3 months of account opening* Earn 50,000 bonus points after you spend $4,000 on purchases in the first 3 months from account opening. The Citi® / AAdvantage® Executive World Elite™ Mastercard® is best for those who are already members of the American Airlines AAdvantage® loyalty program. The requirements of the sign-up bonus might be a bit high for some — Earn 50,000 American Airlines AAdvantage® bonus miles after spending $5,000 in purchases within the first 3 months of account opening* — but the bonus points may allow you to book a flight, depending on where you want to go. Some might find the flexibility — and bonus points — offered by the Chase Sapphire Reserve® a better deal. The Chase Sapphire Reserve® lets you earn 3X points on travel immediately after earning your $300 travel credit. 3X points on dining at restaurants & 1 point per $1 spent on all other purchases. $0 foreign transaction fees. This offer is more robust than the Earn 2 AAdvantage® miles for every $1 spent on eligible American Airlines purchases & 1 AAdvantage® for every $1 spent on other purchases*’s Earn 2 AAdvantage® miles for every $1 spent on eligible American Airlines purchases & 1 AAdvantage® for every $1 spent on other purchases*. But you can’t beat perks like priority access and boarding, a free checked bag and a complimentary Admirals Club membership offered by the Citi® / AAdvantage® Executive World Elite™ Mastercard® if you’re an American Airlines frequent flyer.